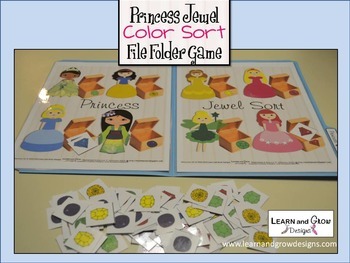 You are purchasing an original, "Princess Jewel Color Sort File Folder Game", created by Learn and Grow Designs. 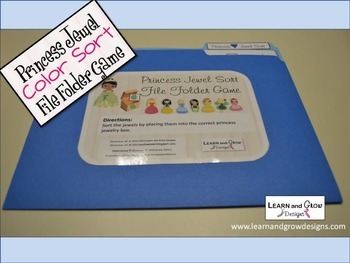 File Folder Games are a fun and interactive way to teach children new skills as well as reinforce familiar skills. 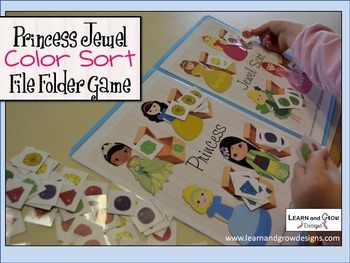 Sort the jewels by placing them into the correct princesses jewelry box. You will receive a nine page PDF file as a digital download. The PDF file contains everything you need to complete the file folder game. No hard copy will be sent to you. 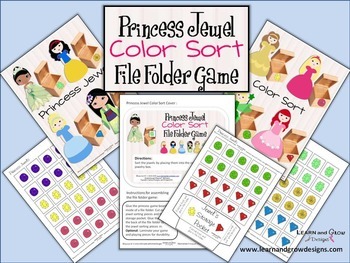 Once you receive your PDF file you will need to print, cut, and assemble the file folder game. You may want to laminate the game for durability. Illustration Copyright -Shauna P. Williams of Learn and Grow Designs, Cupcake Cutiees Designs, and Scrapworld. All of the materials received in your purchase are copyrighted by Learn and Grow Designs, and Shauna P. Williams, all rights reserved. For personal and classroom use only. Please respect the time and creativity I put into making these items. Teaching materials and Kit contents may not be resold or shared with file sharing groups such as Giga Tribe, yahoo groups, blogs, etc. Adobe Acrobat Reader is recommended in order to open this PDF file. I you don't already have Adobe Acrobat Reader it is free to download from the adobe website at www.adobe.com. Don't forget to check out my other great educational and artistic items in my Learn and Grow Designs Shop as well as my blog, www.learnandgrowdesigns.com.